Pure Sunshine Solar Cleaning not only knows how to clean solar panels, but we’ve been finalists in the emerging innovation category for our approach and green energy technology. We believe solar energy is one of the most economically viable and environmentally friendly solutions to our future energy needs and take great pride in providing our environmentally conscious customers with an affordable solar panel inspection and cleaning service. This is what inspired us to enter into the solar panel cleaning industry and and continuously develop our techniques over the years. Just like windows get dirty and become difficult to see out of, solar panels get covered in debris, dust, and mould making it difficult for the sun to penetrate through. Airborne pollutants (caused by fossil fuels), twigs, leaves, moisture, and even animal waste, accumulate covering the surface of your solar panels. This layer or film, significantly reduces your solar panels efficiency meaning you save less money on your power bills. Having your solar panels regularly inspected and cleaned ensures you are benefiting from their maximum efficiency. Clean solar panels work better and last longer too! The expected lifespan of well-maintained solar panels can be considerably longer, as some animal waste and airborne pollutants can be corrosive to components of the solar panel unit. With our North Brisbane Head Office, our team now services all areas throughout Brisbane and between the Gold Coast and the Sunshine Coast including Ipswich and the Moreton Bay Region. Professional Service – our dedicated Brisbane Head Office staff lead a team of trained and licensed roof-top solar panel cleaners and maintenance staff. With several solar panel cleaning crews, we are able to promptly service all areas between Gold Coast, Brisbane and the Sunshine Coast. All of our crews utilise the very latest tools and safety equipment. Environmentally Friendly – we use Brisbane’s most effective environmentally tuned solar panel cleaning method, including specifically designed bio-degradable and pH neutral solar panel cleaning detergents. 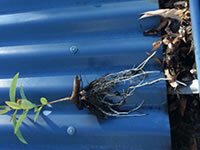 Gutter Cleaning – we can also provide a reduced cost (already on-site) gutter clearing and cleaning service. 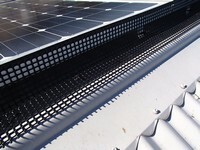 Bird Proofing – we can bird proof your solar panels too. (Ask us about our Bird Proofing Solutions!) You may even be eligible to receive a solar panel cleaning FREE with the installation of our bird proofing system! 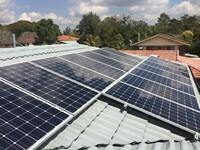 Affordable Service – we are Brisbane’s most affordable and reliable solar panel cleaning service. Sparkling Solar Panels – most of our work comes from referrals! This adds testament to the Brisbane based solar panel cleaning service we have been providing over the years. Customer Service – we’ve also been nominated for awards in this category. Highly trained and equipped solar panel cleaning staff….